These attractive industrial styled shelving / wardrobe systems are all made to measure in a range of sizes. The units consist of rustic chunky stained timber shelving and heavy duty industrial style pipework and fittings. The sizes available in this listing match the picture including 1 set of shelving each side and 3no. hanging rails. All assembly fixings and fittings are included. All wood is treated with dark timber stain and drilled accordingly. 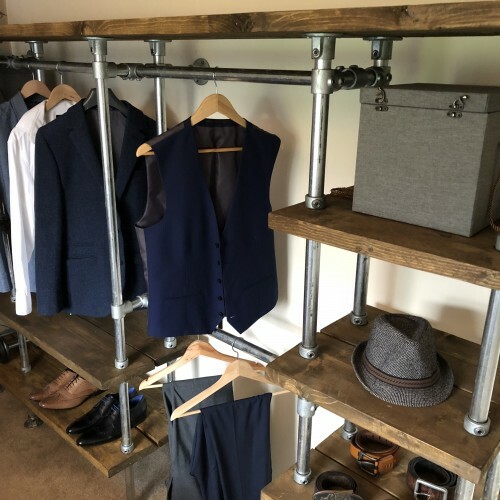 Some standard sized units are listed for sale but please contact us with any bespoke size requirements or design ideas- this system is very flexible and can be adapted to include more shelves or hanging rails in various configurations as required.